The new 60g Munch Bag is available in three of Lay’s most popular flavours Salted, Caribbean Onion & Balsamic Vinegar and Spring Onion & Cheese. The new pack size taps into a core consumer need for a snack product that offers the ideal serving to enjoy solo. “This also delivers on Lay’s promise to constantly evolve their brand by responding to consumer trends,” adds Hlophe. The Lay’s Munch Bag is available from select major retailers and forecourts across the country. 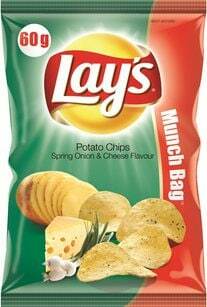 The launch of the Lay’s Munch Bag is supported by themed in-store point-of-sale and PR.